Original AES copies of 2nd Squad are tough to find. Today, MVS arcade cartridges can be converted to AES home console cartridges. Note 1: Like shooting games? Check out my reviews of Operation Wolf and Cyber-Lip! Note 2: This game was played on a Neo Geo AES home console that was modified to output in component video (red, blue, green). It was connected to a 32 inch-HD tv. *While you can find several other reviews for Shock Troopers: 2nd Squad online, many of them spend too much time comparing the game to its predecessor, Shock Troopers. This review will focus solely on 2nd Squad. 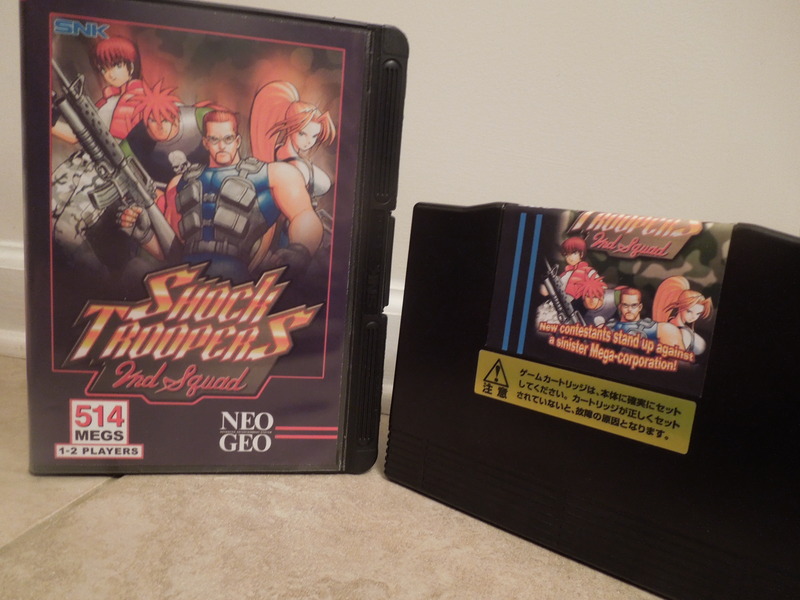 Quick History: Shock Troopers: 2nd squad was released for the Neo Geo AES home console and Neo Geo MVS (arcade cabinet) in 1998. 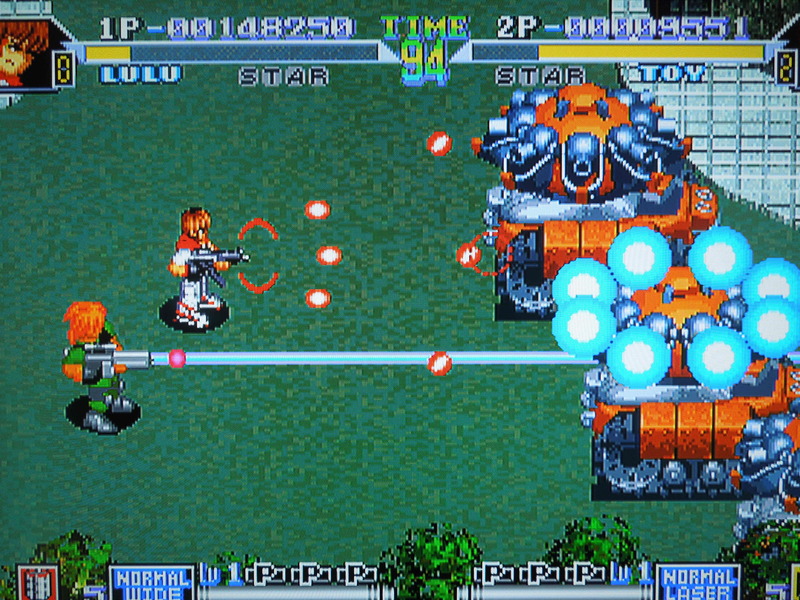 It was a sequel to Shock Troopers, which was only released for the arcade MVS. The game’s home console release did not receive a large production run, making the AES cartridge a bit on the rare side. 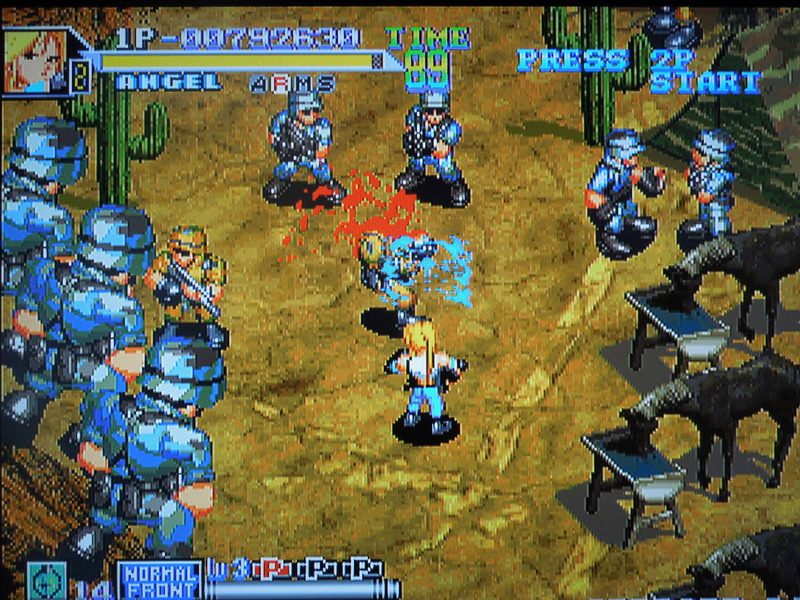 The copy of Shock Troopers: 2nd Squad used for this review is an AES conversion, meaning the game boards from an MVS arcade cartridge were placed into an AES cartridge. Neo Geo Memory Card, Credits, Difficulty: This game has no saving functionality when using a Neo Geo Memory Card. Because of this, you’ll only have the game’s given 4 Credits to beat the game – you get 3 lives per Credit. You can set the game’s difficulty from Easy, Normal, MVS (arcade), or Hard. On the Easy setting, you lose less energy when shot, and you can take between 3 and 5 hits before you lose a life, depending on who your character is. On the Normal, MVS, and Hard settings, approximately 2 shots will kill you, depending on your character. However, with practice, you can beat the game on all difficulties. Story: An organization known as DIO, led by the evil Nakatomi, is threatening to take over the world using military force, and DIO’s armies are killing innocent people along the way. The Shock Troopers are sent in to stop them. 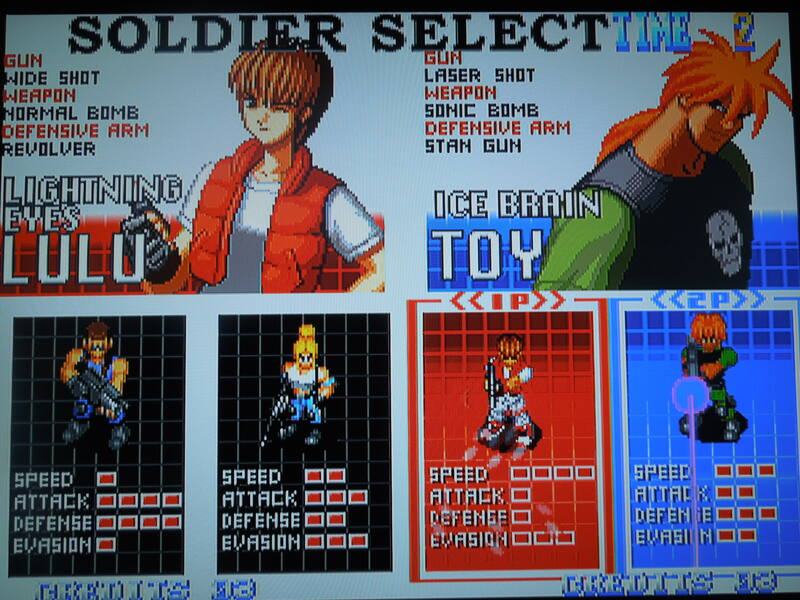 Characters: Choose from 4 Shock Troopers – Leon, Angel, Lulu, or Toy. Each character has his or her own stats for 4 categories – Speed, Attack, Defense, and Evasion. The higher their statistical bars, the better they are at each attribute. Naturally, the characters are all diverse with regards to these categories – Leon has great attack power and a good Defense, meaning it takes more shots to kill him, but he moves slowly; Lulu moves around quickly but has a weak attack and low Defense, so she’ll die quicker when hit; Angel and Toy are more balanced among the categories. Each character has their own unique gun that can be ‘powered up’ as you gather ‘P’ icons in gameplay. 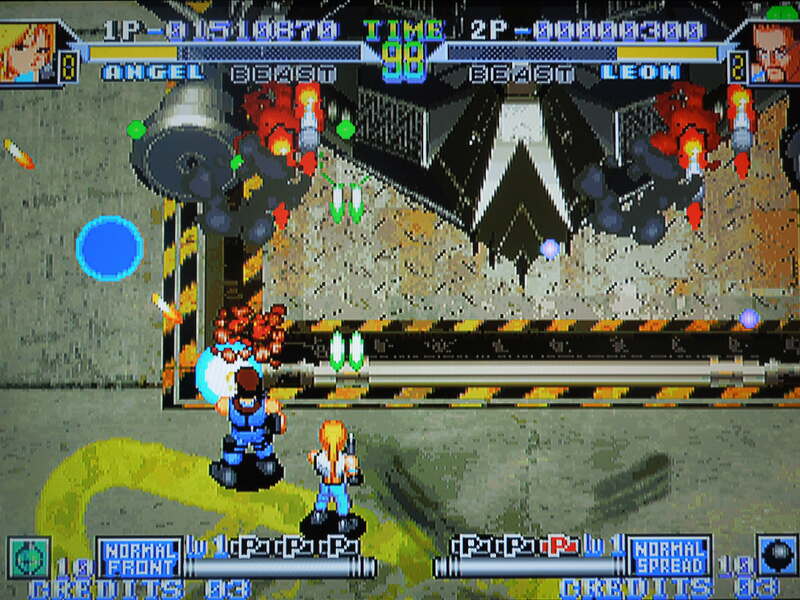 Leon and Angel use machine guns, while Toy uses a laser gun and Lulu uses a Spread gun. Each character also has their own limited number of ‘bomb’ special attacks, which will cause major damage to enemies, and are best saved for bosses. 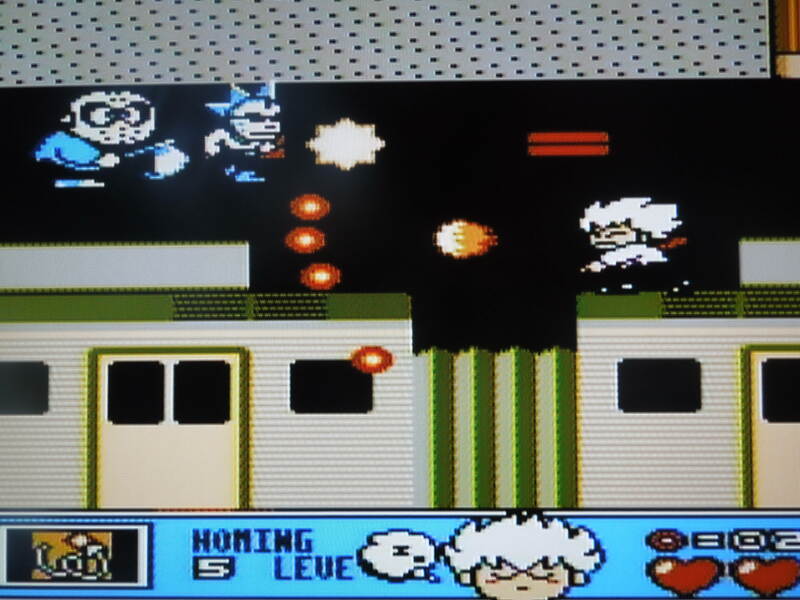 Extra bombs can be found in the game’s stages. All 4 characters play differently and have their own unique gun. Control: A shoots. When in close to an enemy soldier, A will use your melee attack, like a knife attack with Leon. These melee attack cause enemies to drop power-ups, like weapon power-ups, special bombs, or health packets to restore some of your energy bar. B throws your special bomb. C jumps, and you can jump in any direction. While jumping you are completely invincible, and this is where the strategy of the game comes into play – you don’t have to simply dodge enemy bullets in 2nd Squad, you can ‘evade’ them by jumping, which is useful because you’ll often be under tremendous fire, particularly from bosses. Gameplay: There are 5 Missions to shoot your way through in 2nd Squad. However, after Mission 1, you can choose which path you want to take, and Missions 2 and 3 are different for each path. Missions 4 and 5 are always the same, no matter which path you choose. Each Mission ends with a boss, typically something mechanical with a ton of firepower, like a huge aircraft. 5 Missions stand between you and victory. The Tank, the Jeep, and other guns: In all of the stages, you’ll have a chance to jump in either a tank or a jeep. These vehicles cause far more damage than your ordinary guns, and you cannot be killed while in them. They have a life bar and after 5 shots or so, they’ll start flashing, and you’ll have to jump out before they explode. You can also pick up special guns that have limited ammo, like a flame thrower, missile launcher, or ’round’ shot, which fires projectiles in every direction surrounding your character. Music & Sound: Good. Some Missions have more slow-paced, easy going music, while others have a quick, frantic feel to them. The sound effects are great too. Enemy soldiers scream when they die, and explosions sound like I would imagine large explosions should sound. The game is in English, and occasionally your character will ‘say’ something, like at the end of mission. Lulu, for example, says “Who are you trying to kid?” after beating a mission, and Leon exclaims “Oh my Gosh!” when he dies. These sound bites are hilarious because they are done by someone with a terrible accent. Regional Differences: If you play 2nd Squad on an American or Japanese Neo Geo AES, there will be blood spurting from enemies when you kill them, and they’ll burn longer when you use the blow torch. If you play on a European console, however, there is no blood and enemies don’t burn for long. Also, if you play on a Japanese console, the controls are a bit different – B is used to jump and C for your special attack instead of B for your special and C for your jump. The games are in English on American and European consoles and in Japanese on that console. There is a lot of blood in 2nd Squad, unless you play on a European Neo Geo AES. Endings: There are 2 different endings to the game, depending on whether or not you kill the final boss within the designated time limit. So, where can I find this game? MVS arcade cartridges are not too hard to find on eBay. Finding an original AES home console cartridge can be tough, however, but today, online websites sell AES conversion cartridges. The game was also released on the Wii Virtual Console. You can also play the rom on a computer. Another excellent 2-player co-op game. Conclusion: Shock Troopers: 2nd Squad is a great top-down, ‘run and gun’ shooter. Tons of enemies fill the screen at one time, and bosses are massive. There is some slow-down when a lot happens at one time, but it does not bother me at all, personally – sometimes it makes boss fights easier. I really enjoy the look of this game – the explosions and death-animations of soldiers are of particular note. Since you can’t use the Neo Geo memory card with this game, and you can’t give yourself any more than the pre-set limit of 4 Credits, you are forced to actually learn the game and how to avoid enemy fire using the C button (jump/evade), and I think that is actually a good thing. The last boss of the game is particularly tough, and there have been many times I’ve gotten all the way there and died, out of Credits…Game Over. All in all, it takes about 35 minutes to play through the game. 2 Player co-op is, as with most video games, a welcome feature and a lot of fun. 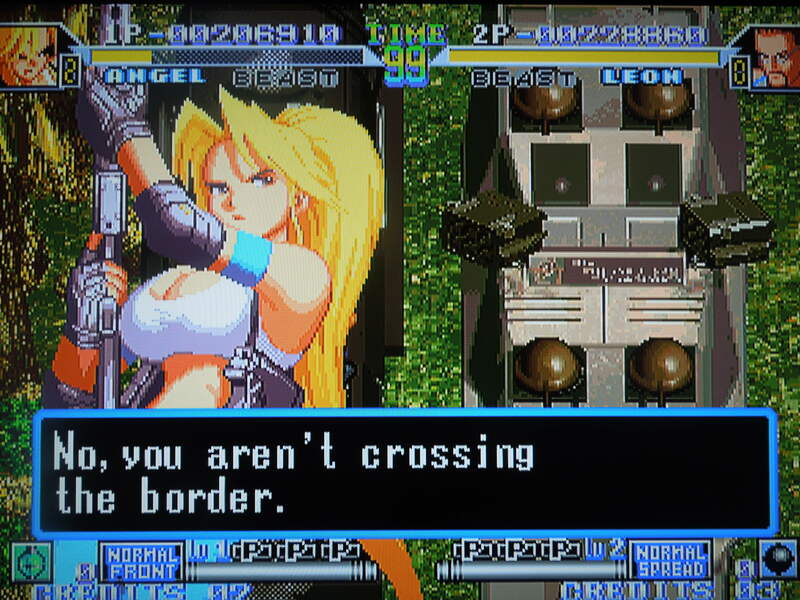 This entry was posted in Neo Geo - Shock Troopers: 2nd Squad and tagged Shock Troopers 2nd Squad Review (Neo Geo AES). Bookmark the permalink.